During Spring 2003, students, teachers, and scientists worked side-by-side, measuring the properties of aerosols (fine particulate matter suspended in the air) over Baltimore, Maryland using hand-held instruments. The campaign had two objectives: providing NASA with high-quality, ground-based measurements to check aerosol properties derived from satellite observations, and helping students learn about possible health effects of aerosols in the region. Health effects are of special interest, since school children in the Baltimore metropolitan area suffer from one of the highest asthma rates in the United States. 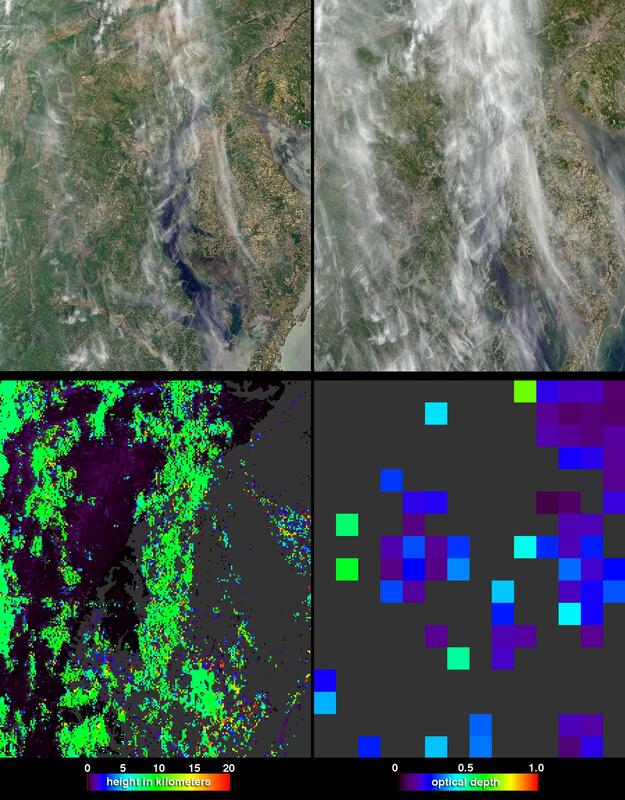 These four image panels from the Multi-angle Imaging SpectroRadiometer (MISR) instrument, which flies on NASA's Terra satellite, were acquired on May 20, 2003, when the sky was about 50% covered by high, thin, cirrus clouds. The two panels along the top are natural-color images from MISR's directly downward-viewing (nadir) camera (left) and 60° forward-viewing camera (right). Cloudy weather predominated this spring, and of the entire three-month campaign, May 20th was the least-cloudy day during which MISR flew over the study region. Cirrus clouds are more apparent at the steeper viewing angle, and appear to shift position relative to the surface between the two camera views due to the effect of geometric parallax. At lower left is a stereo height field derived using the parallax effect. It shows that most of the cirrus clouds are about 10 kilometers above the surface. At lower right is a map of satellite-retrieved aerosol amount (optical depth). These MISR products have different scales. MISR's highest-resolution imagery is acquired at 275 meter pixel resolution, about the same size of a major league baseball stadium, whereas the aerosol retrievals are produced at 17.6 kilometers, about the size of a small city. 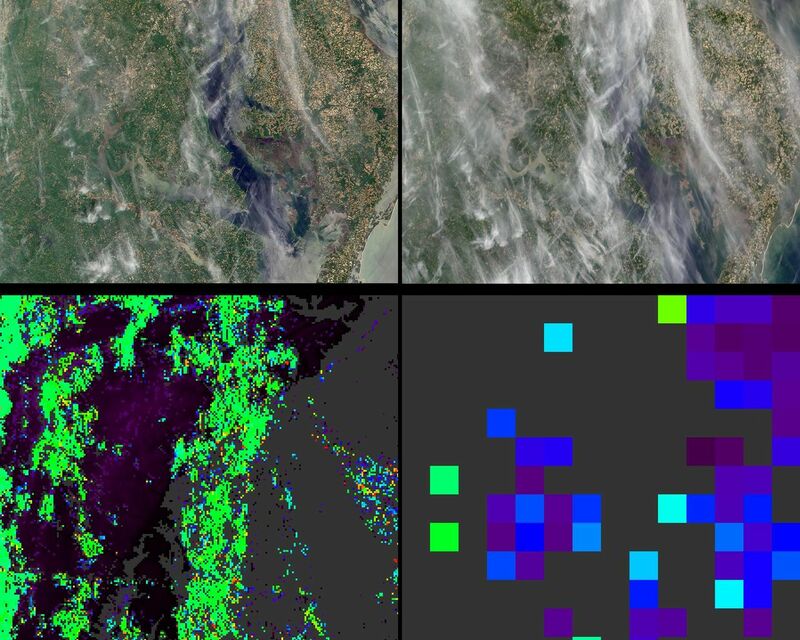 To derive aerosol amount, the MISR retrieval algorithm examines the variation in scene brightness over nine view angles and four spectral bands. Under cloudy conditions, it is especially challenging to measure aerosol properties, and MISR makes use of special multi-angle cloud-screening techniques. The AERONET global network of autonomous, ground-based, aerosol measuring instruments plays a key role in testing satellite aerosol retrievals. For the May 20 Baltimore experiment, scientists set up an additional eight AERONET instruments at schools and in parts of the Washington Metropolitan area to supplement the standard AERONET stations. Students at 12 schools also used hand-held sun photometers to measure aerosol amount as Terra, and several other satellites flew overhead. 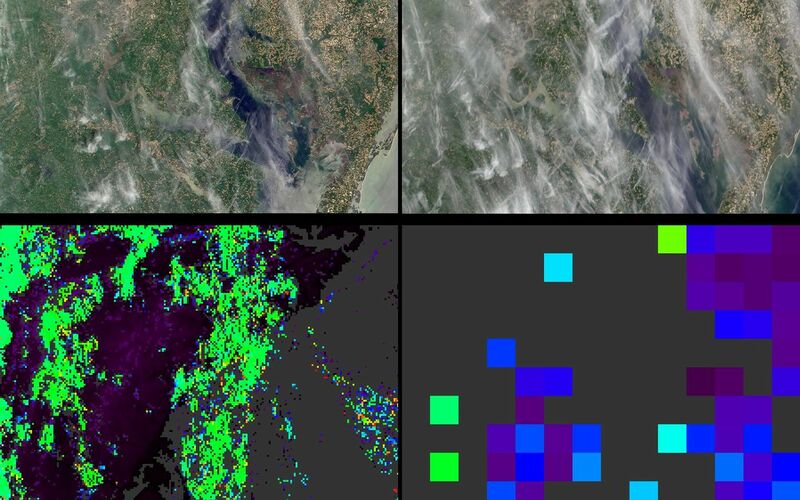 The campaign team will combine the single-point measurements made at these ground stations with the regional aerosol picture obtained from the satellites, to create a clearer view of Baltimore's aerosol characteristics. They will then compare the derived aerosol distribution with survey data on health effects, such as the incidence of asthma, to complete their study. The Multi-angle Imaging SpectroRadiometer observes the daylit Earth continuously from pole to pole, and every 9 days views the entire globe between 82 degrees north and 82 degrees south latitude. 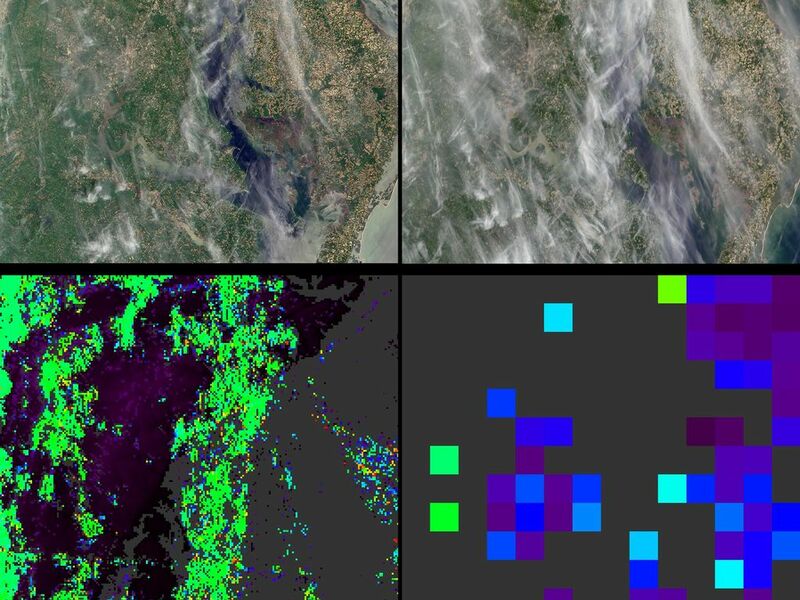 These data products were generated from a portion of the imagery acquired during Terra orbit 18193. The panels cover an area of about 246 kilometers x 292 kilometers, and utilize data from blocks 59 to 60 within World Reference System-2 path 15.